Yarra libraries will screen Out of the Closets, Into the Streets and this will be followed by a panel discussion. The panel will provide a contemporary context and discuss the impact of contemporary debates on the wellbeing of LGBTI+ communities. This will be presented as part of Mental Health Week from October 8 to 14. Old Courthouse Theatre, 7 Camp Street, Ballarat Central, VIC 3350. Ballarat’s inaugural Frolic Festival advances the acceptance, positive viability, health, well-being, and the unique culture and art of the LGBTQIA community in the Ballarat region. The Frolic On Screen film night will include a Q&A with the creators and a screening of this years’ short doco Out of the Closets, Into the Streets. In 1970s Melbourne a group of students made a stand for gay pride at a time when homosexuality was criminalised and discrimination and abuse was widespread. When being gay meant hiding your true self. Where the act of coming out was a radical form of protest. 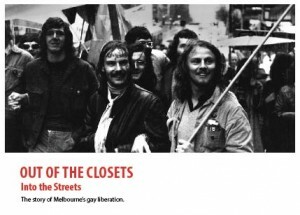 Out of the Closets, Into the Streets explores the moment Melbourne’s gay and lesbian people found their voice through the Gay Liberation Movement. The story documents the moment gay and lesbian people took to the streets, coming out and proud and challenging the status quo.